Step 1: Remove parts from the instrument so that all areas can be exposed to cleaning. 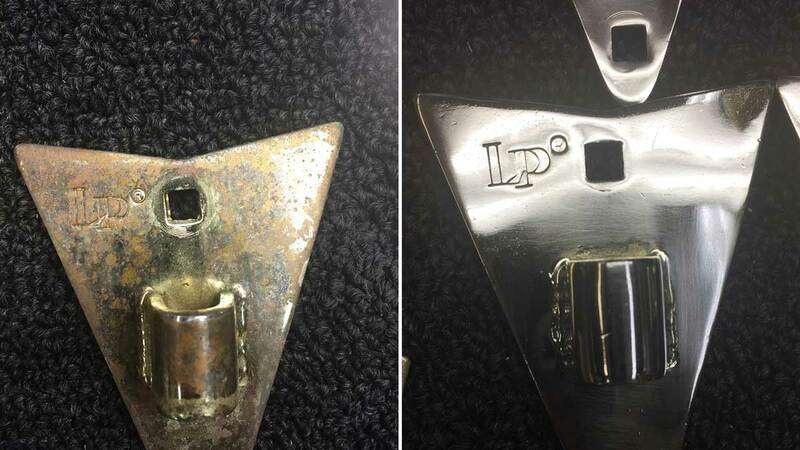 Do not try to clean or remove rust with parts still attached the instrument. For instance, remove all lugs from the drum so they can be cleaned individually and all the way around. Step 2: Clean the surface with a soft cloth and dish soap with warm water to remove any surface rust, dirt, dust, or grime that has built up on the equipment. Clean the area as many times as needed depending on the severity of the dirt and surface rust. If you are dealing with more severe levels of dirt or surface rust, using a diluted solution of denatured alcohol and water can help clean things up even further. Be sure to put the solution on the cloth rather than directly on the instrument to avoid over saturating the metal, or water getting in places you may not expect. Step 3: (Optional) If you are dealing with severe rust, you can soak parts such as rims, lug casings, tension rods, etc. in dawn dish soap for a few hours to help loosen some of the more built-up areas of rust. There are some other options here such as soaking in Coca-Cola, vinegar, and even lemon juice. Step 4: Use a grade “0000” superfine steel wool or Scotch scour pad (preferable) to remove the larger areas of underlying rust. Use a small amount of denatured alcohol solution for more severe instances. As you work, use a soft cloth to occasionally wipe away excess solution or rust particles. This ensures you are always working with the cleanest surface possible. Step 5: Once you have removed the rust, clean the surface one last time with a soft cloth and dish soap/water. Step 6: Polish or wax the chrome using a buffering cloth and polishing compound. Although though the compound may vary by metal type, SimiChrome works well for many of the common metals or plating used in drums parts. Additional options include Brasso or Never Dull. Repeat this step until satisfied with the results. Keep in mind that rust can affect percussion instruments in many ways. Rusted out lugs can cause issues with tuning the drums or rusted bell bars will have a lack of resonance. Sometimes you might need more professional level equipment to remove rust and polish, such as when plating has been removed or chipped. Always remember once something is brought from OLD to NEW, weekly/monthly maintenance is the key to keeping it in top working condition! Be vigilant about checking for dirt, dust, and rust and you will have working equipment that can literally last a lifetime. 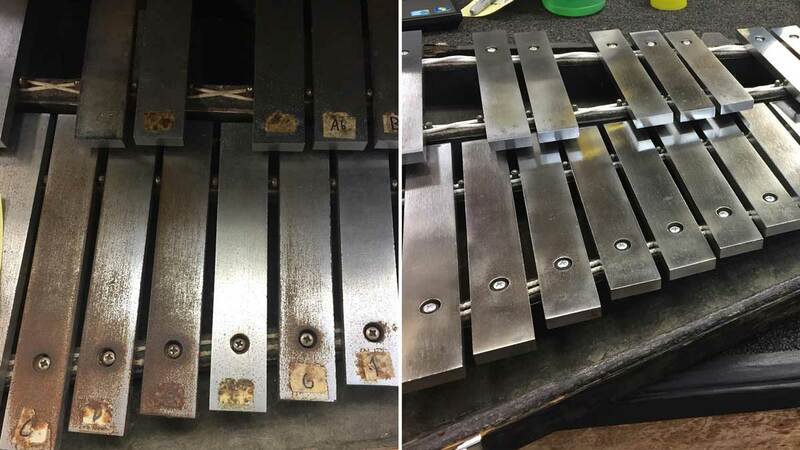 If you find yourself needing more professional restoration and help cleaning an old instrument, the repair department at Paige’s Music is fully equipped to handle almost any percussion restoration project. Call or email today to find out more information and bring those old instruments back to life!